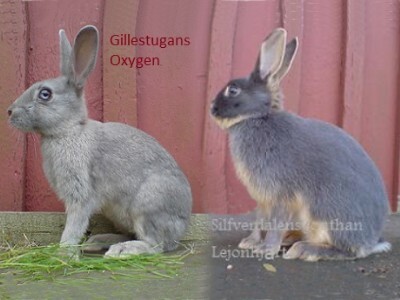 The Elfin Rabbit and the Swedish Hare, bred specially for rabbit sports, were being developed simutaneously in the U.S. and Sweden. Because they were essentially the same breed, discussions were made to combine. The U. S. breeders decided they preferred the name Swedish Hare, and were welcomed into the Swedish ranks. A founding father in the U.S, an arched sport from Mini Satin lines, "Mmm" is athletic and outgoing. He is friendly and active and enjoys exploring. A good example of the desired type, I think he is typical of the perfect rabbit for Rabbit Agility. Another U.S. reference sire is "Carl", a Chestnut Britannia Petite. He is rather mellow for a Petite and outgoing. He has a white toenail that would disqualify him as a Petite, but certainly would not affect his ability to jump. Fortunately there are no toenail color disqualifications.. He was used to improve the strong arch and spritely and friendly temperment. "Dollar" is a ARBA champion Polish. He offered his wonderful temperment and broken pattern. He was used to reduce the size of larger athletic breeds and improve docility. The arched type U.S. bred Rhinelander is more like the Swedish Hare than the meatier typed European bred Rhinelander. "Char", is a founding mother because she has the type and temperment that she passes down to her kits. She is athletic and easy to handle and never gets too fat. The small hares can often be left with a full feeder and they only eat what they need. Some good examples of the Swedish Hare in Sweden. Look at those blue eyes. What fun! Note the nice length of the front legs. The Belgian Hare has been used extensively in both the United States and Sweden to develop the Swedish Hare. Making the size smaller while increasing the bone and hardiness allow the Belgian bred rabbits to hop well. A black tri color Swedish Hare, showing some Rhinelander influence. He is getting close to the ideal type.